Respiratory therapist Jeffery Davis shows a student at the health fair how the human respiratory system works. When people think of careers in health care, doctors and nurses probably come to mind. But a vast array of allied health care professionals — respiratory therapists, pharmacists, phlebotomy technicians and countless others — also play important roles in hospitals and patient care. To introduce young people to what it’s like to work in these fields, the UCLA Health Allied Health Job Fair program recently invited 115 students — 9th graders at Huntington Park Institute of Applied Medicine, a pilot school at Linda Esperanza Marquez High School — to learn from health professionals at Ronald Reagan UCLA Medical Center. The UCLA program aims to educate kids from schools in inner-city Los Angeles about hospital careers that are in high demand and projected to continue to be so in the near future. 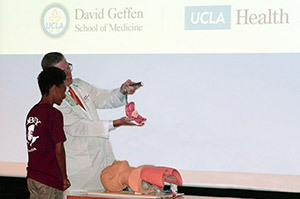 UCLA Health professionals from a variety of fields described their jobs, and many did hands-on demonstrations of tasks they perform. 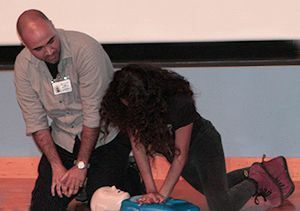 Ruben Santana, an emergency medical technician, demonstrated how to perform CPR (cardiopulmonary resuscitation), using a dummy, and how to use an AED (automated external defibrillator). Christy Lundy, a physical therapist, showed how she teaches patients to use crutches and climb stairs before they are discharged from the hospital. Respiratory therapist Jeffery Davis explained the human respiratory system functions and showed students how to insert a breathing tube. Anna Pabustan, child life specialist who helps pediatric patients cope with hospitalization, demonstrated how she uses dolls and toys to help children understand their medical procedures. The 9th graders also learned about the education and training required in a variety of fields and the local schools that provide this training. They also got the dollars-and-cents of UCLA Health's starting salaries in these fields. As the job fair drew to a close, the students were provided with guidance for learning even more about allied health careers, from visiting this UCLA Health website to asking their high school counselors about classes they can take to prepare for a health care career. They were also encouraged to get first-hand view of working in health care by volunteering at a hospital or shadowing a health care professional on a typical workday. Marcia added that the Allied Health Job Fair, which also offers a career guide, travels to high schools throughout L.A. In the past year alone, the program has reached more than 26,000 Los-Angeles area students. Plans are currently under way to expand the program’s offerings to include scholarships, job opportunities and continued mentorship for students.